I’ve always been super-impressed by the Queensland Police Service (QPS) and how it has leveraged the power of social media to deepen the connection it has with the public. I mean, how could you not like an organisation that holds a press conference to make an announcement and then (tongue-in-cheek) ties that announcement to World Zombie Day? – see video below. 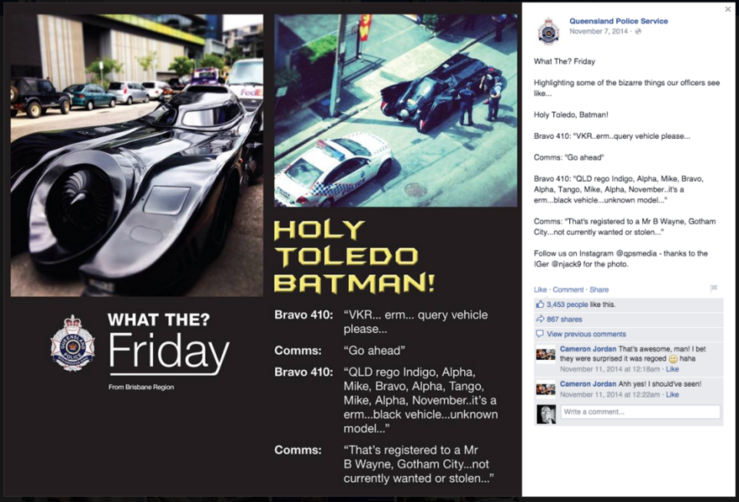 A low-key post published today to the QPS Facebook Page (below) shows why this police department is head and shoulders above 99 per cent of brands out there when it comes to social media. In just 37 words, they’ve managed to tap into the pop culture news of the day (Game of Thrones) while at the same time deliver a timely safety message. What can we learn from the QPS? While we know visuals work well on social media (and QPS is excellent in this regard), sometimes well worded copy is all you need to get a reaction. Show up regularly/daily e.g. QPS has tweeted 40,000+ times – how many times has your organisation tweeted? Social media works best when imbued with personality – QPS is not scared to show its humorous side, and it’s a key reason the department has managed so successfully to engage its constituents. Leading on from the point above, wrap important messages with creative execution (and if fun is involved, so much the better – QPS, for example, effectively taps into big cultural events). Tell micro-stories, and don’t forget to find the humanity in your day-to-day business. Take the public behind the ‘velvet rope’ of your organisation – and always feature your people! Experiment with different mediums: QPS, for example, publishes audio to its SoundCloud page and streams live video on Livestream. Bottom line, here is a government authority that operates in a pretty serious business. Much of what the QPS does on social media is everyday police stuff – news reports, warnings etc. But rather than use social media merely as a one-way broadcast channel to force-feed the public its key messages, QPS understands that community engagement is what makes social media so powerful – if you want people to follow you and take note of your more serious stories and messaging, then engage them in advance with human stories and content that’s executed in fun and creative ways. Oh, and engagement also means people will like, comment upon and share your content, thus amplifying your reach and increasing the level of (visible) public endorsement you receive. 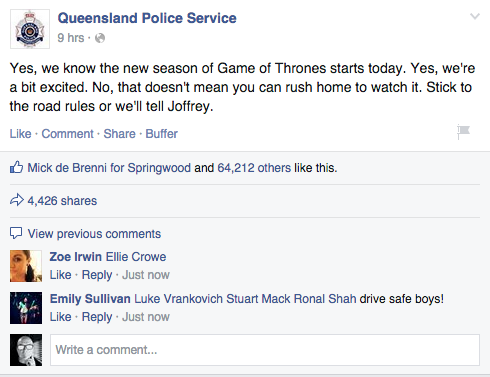 The Queensland Police Service gets this. That’s why you should keep a close eye on what they’re doing. We can all learn a lot from them. Oh, I also like how QPS has a magazine-style content aggregation site that it sends the public to from Twitter – check it out here – http://mypolice.qld.gov.au/.